Raw Green Organics (RGO) is a mission-driven company making some of the most unique organic nutrition products and supplements on the market today. Their Organic Vegan Protein Powders offer a robust blend of plant-based proteins loaded with amino acids, branched chain amino acids, and healthy Omega oils. Raw Green Organic’s Vegan Protein Powder has all of it’s ingredients harvested from sustainable, renewable sources. This resonates RGO’s mission well, and sets a stellar example for consumers and businesses alike. The benefits of Vegan Protein Powder is well illustrated in RGO’s use of several different plant-based protein sources. This variety of ingredients allows for a fuller profile of amino acids and nutrients, leaving many to regard plant-based blends as the best protein powders available for total nutrition. Raw Green Organic’s Vegan Protein Powder contains organic Pea protein, Organic hemp protein, organic Sacha Inchi protein, and organic flax seed. This unique blend offers a powerful amino acid profile and supportive nutrients to allow for better overall bioavailability. Protein powder supplements have been largely whey-dominated for years. Bodybuilders and fitness pros swearing by the milk protein’s ability to provide the best muscle building profile of amino acids available has lead many to falsely believe plant based proteins are inferior. That likely used to be true, but nutrition gurus have learned that by blending together multiple plant-based protein sources, a more robust nutrient profile can be had. Raw Green Organic’s Vegan Protein Powder contains pea protein, which has shown many benefits in it’s ability to offer the desired effects of whey proteins. For example, pea protein helps lower levels of the hormone Ghrelin (hunger hormone) and is also loaded with peptides that slow down the emptying of your stomach. This is an ideal benefit if you are on a calorie-restricting diet, as it can help reduce your urge to eat while still providing you with valuable nutrients. This Vegan Protein Powder also contains organic hemp protein, which has been known to be the most easily-digestible form of plant-based protein. The amino-acid profile of hemp protein contains many essential and non-essential amino acids, but also has branched-chain amino acids (BCAA) leucine, isoleucine, and valine. These offer powerful results to those looking for holistic nutritive support for active lifestyles and building lean muscle. The organic flaxseed found in Raw Green Organic’s Vegan Protein Powder is another superfood ingredient that is packed with health-boosting nutrients. Flaxseed is most commonly recognized as a powerhouse of heart-healthy Omega oils, but has many other nutrients that are powerful as well. Flaxseed is high in p-Coumaric acid which is a powerful natural antioxidant. Antioxidants are renowned for offering many healthy benefits, but are also apt in their ability to help reduce the types of inflammation that occur after strength exercises. RGO’s Organic Protein Powder also contains organic Sacha Inchi protein, which is a bit off the beaten path for many. Sacha Inchi plants grow these curious little star-shaped seed pods, that have very peanut-like nuts in them. While research around Sacha Inchi is still growing, this superfood offers a powerful amount of healthy omega fats as well as other beneficial compounds shown to aid in weight loss. Raw Green Organic’s unique blend of ingredients in their Organic Vegan Protein Powder has given rise to a nutrient-dense profile of powerful amino acids and healthy omega fats ideal for anyone, including bodybuilders. Vegan protein powders are comprised of plant-based ingredients only, in adherence with the guidelines of a healthy vegan diet. Throughout the years, vegan and plant-based protein powders have gotten a lot of criticism for not being ‘complete’ protein sources. This accusation, largely made by non-Vegans and non-Vegetarians, alleged that plant-based proteins couldn’t provide as full of an amino-acid profile as their animal-based competitors—such as whey protein powder. This is true to a degree, the use of several plant-based ingredients can easily provide a powerful amino-acid profile, just like egg or milk based proteins. 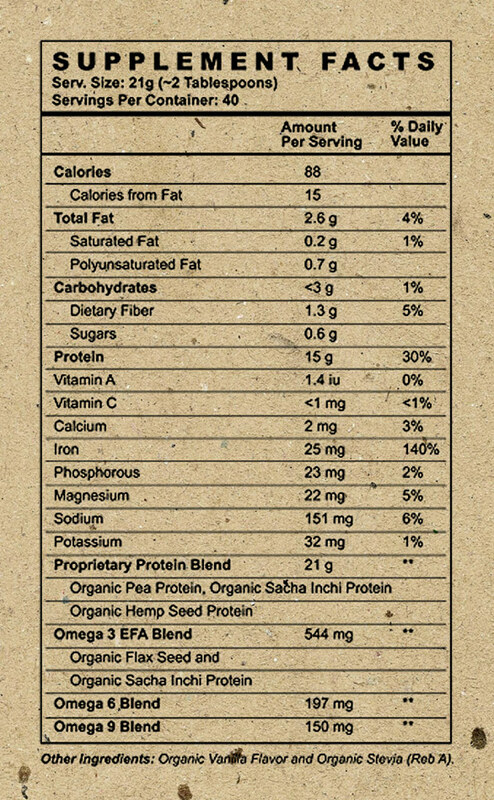 Raw Green Organic’s Vegan Protein Powder makes use many different plant-based ingredients such as peas, hemp, flax, and sacha inchi to provide a fuller overall amino acid profile. Your body has to have amino acids in order to make proteins. That’s how it works—there’s little way around it. When it doesn’t have access to the necessary amino acids to make new protein structures (like muscles) it will begin to break down existing structures (muscles) to get them. This type of process is know as a catabolic process, and can be very damaging to your health. By ensuring your body is given access to the needed amount of amino acids, you can help ensure that healthy muscle growth and strength increases can take place. There are 20 different amino acids that work to form proteins in your body, although 9 of them are considered to be ‘non-essential’. That means that your body can’t make these compounds on it’s own, and that you must get them from your diet, everyday! The Organic Vegan Protein Powder from Raw Green Organics is a great way to provide access to these types of compounds to ensure your body is never without. Raw Green Organic’s products are available for online purchase, and can be found along with many other great products from the official Raw Green Organic’s online store. There you’ll find all the varieties of the great products this company has to offer, and often find great sale prices. They have a very convenient subscription program for their products as well, which can offer discounts of up to 25% is chosen. This is an incredible product, sold by an incredible company, and is a must-try for anyone interested in plant-based protein powders. There are few companies in the world that are dedicated to responsible manufacturing, and Raw Green Organics is one of them. This astute attention to responsibility is reflected in their business, as well as the quality of their products. Vitamins and supplements, such as protein powder, can be very susceptible to shady marketing and manufacturing processes. Many companies are simply buying bulk powders from overseas and re-branding them. These dangerous practices have flooded the consumer market with mis-labeled ingredients, and often bring products to market that have dangerous levels of heavy metals and toxins. Now more than ever, it is critical to purchase supplements and nutrition products from brands that are trustworthy and known to pay close attention to every detail during their manufacturing process. Being USDA Certified Organic is a great first step to take, but companies such as Raw Green Organics that go even further—with sustainable harvesting, single batch inspections, cGMP manufacturing, etc—represent an higher class of quality. 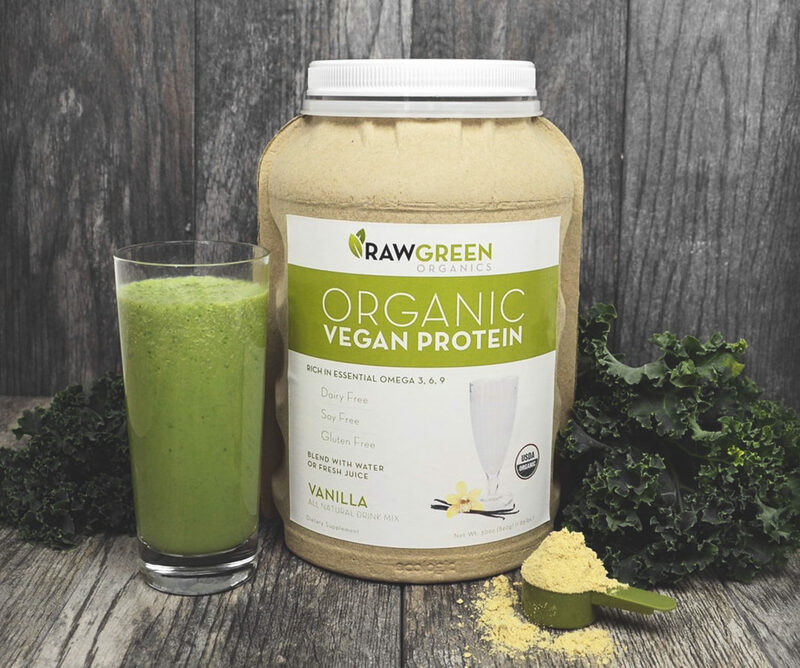 Overall, Raw Green Organics is an incredible company, and their Vegan Protein Powder is a tremendously high-quality product with a dense nutritive profile. This organic vegan protein powder offers multiple plant-based protein sources to provide a rich amino-acid profile full of essential and non-essential aminos as well as branched-chain amino acids. It also includes protein from flaxseed and sacah inchi to include very beneficial amounts of omega fats.